Anyone else seeing g this as bugged. Last arena fight my zombie never gained the speed up. Got hit like 5 time in a row and still had the -1 speed from a death but never gained the speed up. Wow it SMUCKS, based on the complaints, the only fix I suspected was loss of TAUNT at 50% health? Guess your understanding of game mechanics is Based on some kind of 8 Ball consulting?? Oops Forgot to hold Your hand through my suspected rework, Endless horde would be unlocked at Star level 7, TYhere bypassing the paper zombie issue of no taunt until attack performed, below 50% health.... The 6 Ball consulting is still suspected?? This new Zombie “fix” has turned my high level Zombie into a useless toon. She could get any damage in Rancor Heroic. Guess I should get this off my Chest too, why haven't you got one ability for each star unlocked on all toons? You seem to only give Damage on toons. why don't Y also give Defence, Offence, and critical chane modifiers for the basic attack/passive abilitires for each star? As the gaining a star, is what a minor milestone? or are you going to say 'We are not Beta testing!" or Do you think the rest of the players Don't believe misdirection is a LIE??? Ns barely even stand a chance now against Jedi of the same gp. Pheonix was very difficult and now practically impossible with g9 zombie. Rebels are the same I'm sure. Used to be back and forth. Now it's mostly complete and utter slaughter. This isn't ok in any shape or form. I've read most of these posts. I have played this game nearly since it's launch. I've spent some money but not alot. Probably the player base that accounts for most of the income the game brings in. There are alot more minnows than whales! I commented on a post one previous time, and got no response, and don't expect one now either. The question is why does your team constantly find ways to set back the guilds working very hard to beat the sith heroic raid. This is not a paper zombie fix. It is a p3 nerf and calling it anything else is a marketing spin. The whales already have treya. Leave us alone and let us earn her the same way! Why it's a p3 nerf. Treya will essentially one shot the "paper zombie" quickly ending endless horde. If you gear her up and retrigger endless horde via her unique. It adds the **** revives. 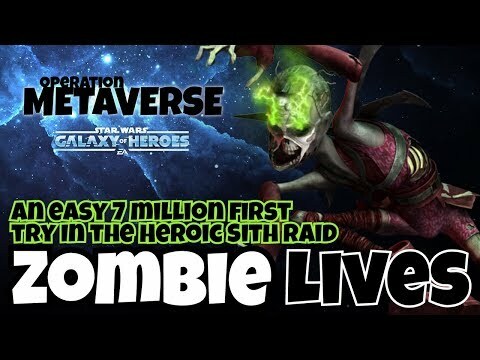 This makes it impossible to kill off initiate and talzin for the p3 run because zombie will revive them. There is absolutely no way that I will be convinced that this is to protect investments made that long ago. This is a p3 nerf! Launching shortly after some **** was dumb enough to make a YouTube video doing major damage to p3 and informing everyone of the viability. This sets my guild back from hsr even longer! I'd like to apologize for this post. 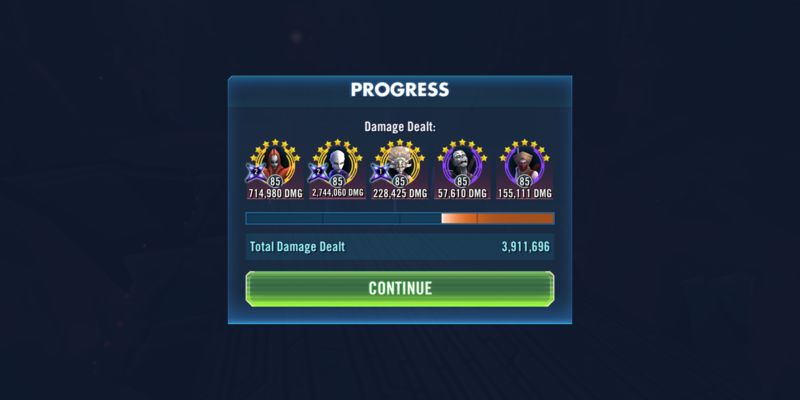 The intention to Nerf in sith raid I still believe is there. But, it didn't turn out as bad as I had originally believed based on the mechanics text. Yes, it lowers top scores in both p3 a and p4 but the average score seems to be about the same. I will refrain from **** until use from now on. . But I will rage quit if you guys somehow attempt one more sith raid Nerf at any point. Whether you want it to be end game or not people will find ways to crush it. That's what we do! Id agree , this seems to go against the raid han not going first excuse, of bonus turn and 100% turn meter being the same , if you have 100 % tm , you should get a turn no matter what your actual speed is , shouldnt you ? The Deathstrom NS squad still works. I scored 10% on heroic. It is harder to get it going, but it definitely works. You can get much higher than that. This wasn’t even a good run. I barely got past enrage. 15-20 million runs are still going to be very common. I got 20%, but that was before the rework. Except, that when a character has speed zero it cannot take turn, no matter how much turn meter then have. This is not new. This is exactly what fracture does. How mad would you be a fractured character was allowed to take a turn after Thrawn swaps turn meter with them (putting them at 100%)? You‘re right with your statement. But then they should modify Thrawn‘s fracture so that it says you can‘t take a turn. That zombie is unable to take a turn after her turn meter filled is just absolutely stupid! It’s certainly annoying that zombie just becomes a dead weight character that can’t die but can’t do anything. What is the point of that? To manipulate a terrible AI that will attack her? There really should be some way to get that speed back. Have Dakas revive remove 1 stack maybe? Lol ban me for a day, I'm still going to tell you that what you've done is low & was brought about by selfish people. She reacts the exact way in which I described. Very dissatisfied & dissapointed. At what point is there a responsibility for consumer protection? Last but not least, when NS zombie began to have problems, it goes worse and worse thanks to the speed decrease. In result, you see when zombie will revive or not (like boba or jango). If she is too weak, she will die normally. New description for Undying sacrifice: When NS zombie die, she automatically regain UNDEAD WILL. When he is supposed to gain UNDEAD WILL and he already has it, make him die and revive with the same health et no speed debuf, then all NS allies gain speed buff. When NS zombie attack with UNDEAD WILL, his damage are doubled. 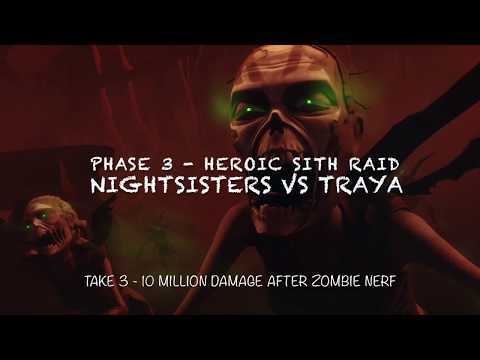 With someting like this, Daka and Ventress zeta will trigger as long as the NS zombie is powerfull enough. And better, the more he is powerfull, the more he will be usefull to do some decent damages. And more importantly, we don't have to be a NS zombie expert to understand what append. This way, I think it improves the faction both in PvP et raid, and solves the problems of the actual NS zombie.